Welcome to our second hand exhibition stands page. 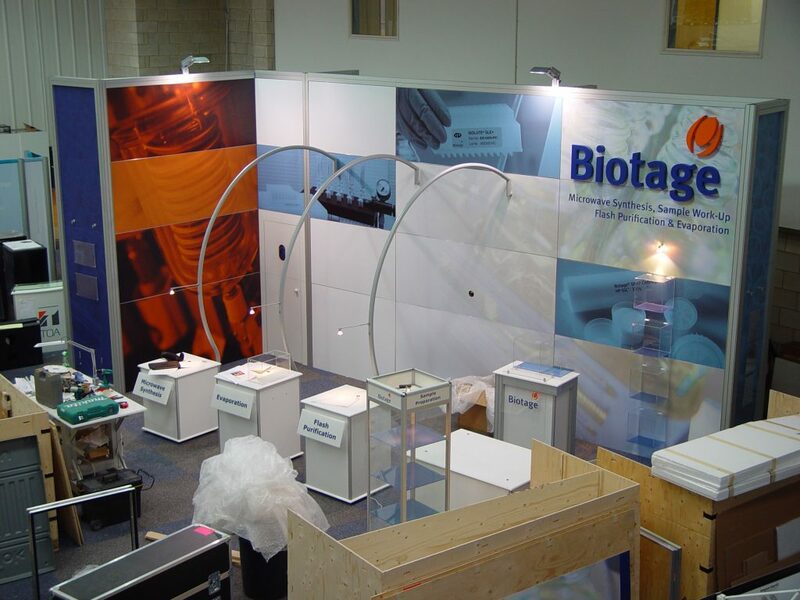 If you are looking to purchase a used exhibition stand then you have come to the right place. If you do not see the sort of thing you are after give us a call we may still be able to help. The second hand exhibition stands and equipment shown on this page may be available for a number of reasons including a change of marketing strategy or replacement with a newer stand, either way, used exhibition stands are a very cost effective way of purchasing your own stand. If you are interested in any of the exhibition stands or equipment shown on this page then please give us a call and we will put you directly in touch with the seller. 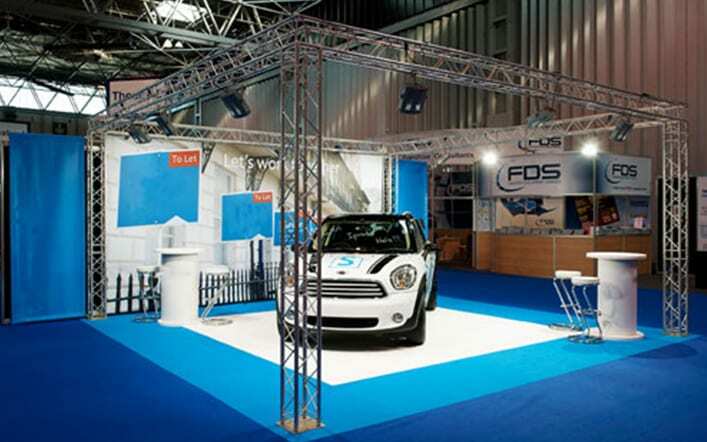 Our “high end” outdoor exhibition stand solution incorporates one of our modular marquees with one of our modular exhibition systems enabling us to provide you with a highly professional, weatherproof, corporate environment in which to exhibit your products, services or entertain prospective clients. Externally the Marquee structure’s wall panels can be fully or partially printed to incorporate your own company colours, logos, images or content of your choice. 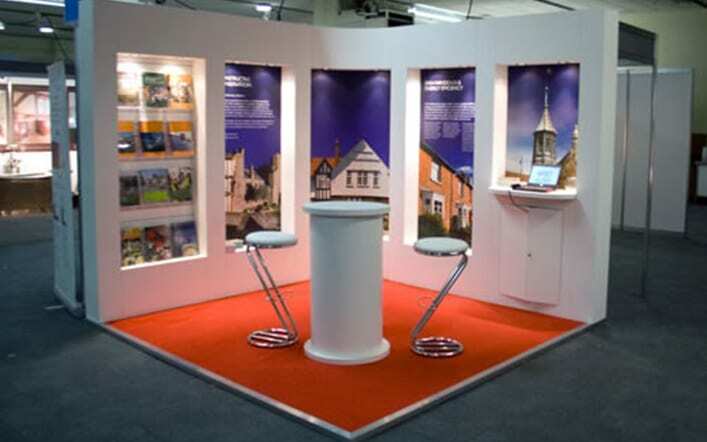 Internally our modular exhibition system can be configured to suit your needs whether you are looking for hospitality, private meeting areas or to show off your latest product or service. Modular exhibition structure comprising MDF walling and large display plinth with custom built 10mm laser cut Perspex cases. Based on a 3 x 1.2m (h x w) panel with one internal and two external corners. Two of the panels have apertures to suit a standard 32″ LCD screen. This does not include any screens or lighting. 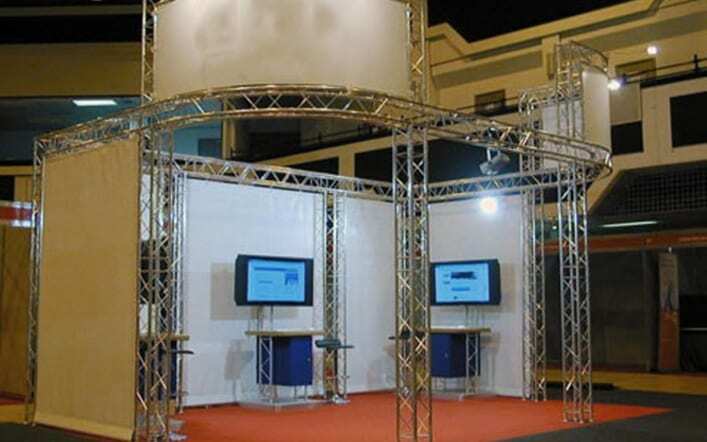 The stand was built to incorporate Opti 200 truss, this is not included, but can be hired. This stand is being sold on behalf of a customer. The system has been used three times and is in a very good condition. It is suitable for an exhibition space of 6m x 6m and has two detachable wings to increase the size to 8m (w) x 6m (d). The cost of the system is £3200.00 + VAT, the cost does not include the carpet, lights, furniture or graphics. These items can be supplied upon request. 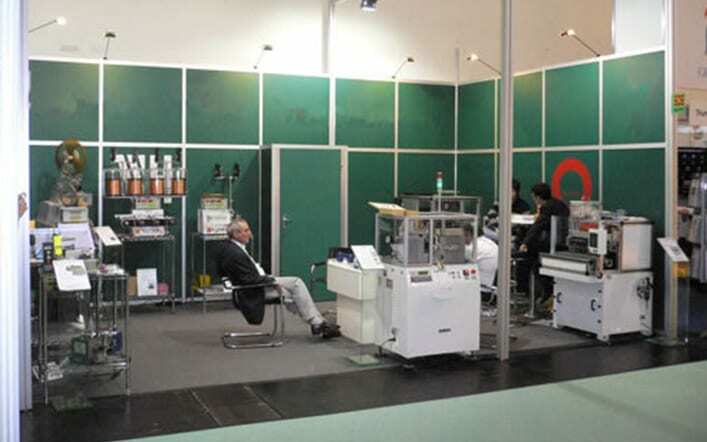 Used exhibition gantry for sale. 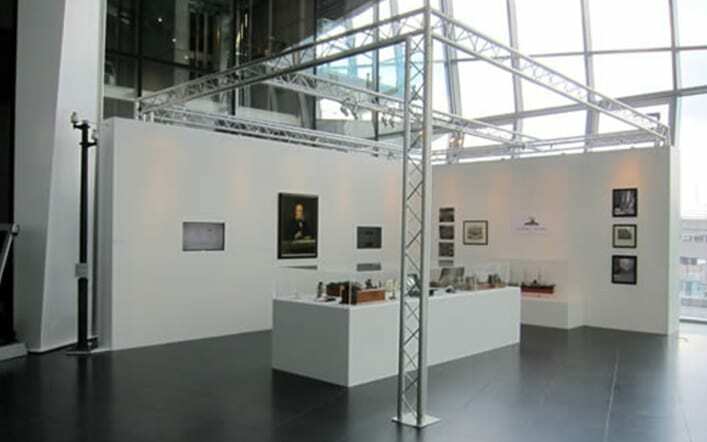 This is a free standing structure made up of a selection of components so that it can accommodate multiple sized exhibition spaces. The stand as seen in the photos fits a stand space 6m x 4m and is 4m high. The cost for the gantry system only is £POA. This system was supplied by ourselves and is readily available if additional components are required. The stand was purchased in 2011 for $30,000 + USD. It has been used 4 or 5 times only mainly for international shows and the last time in 2015. It is stored in its shipping containers which comprise of 3 off 1.2 x1.2 x 2.5M wooden shipping crates. (They can be seen in some of the pictures). The unit was designed by Nimlock and it can be configured with several options and build plans for a 5 x 7M and 8 x 5M are shown as examples. The unit is modular and has free fitting display boards that can be reprinted with new graphics. We need to dispose of the unit as it is too large for current shows held in Europe and we have not used it since 2015 so the space it is occupying is required. All the main frames and boards are present but some of the free standing display cases will not be included. The unit may need some replacement connectors and the lighting will need replacing or servicing. Its condition is in keeping with 4 international shows. The unit will be sold “As is” with no warranty. Own collection will need to be arranged.